Patrick Wilson and Vera Farmiga play Ed and Lorraine Warren, two early paranormal investigators are called into help Carolyn and Roger Perron (played by Lily Taylor and Ron Livingston) when the farmhouse that they recently bought at auction turns out to have some severe paranormal issues. (Why does no one ever check the floor plans and history of these places when they purchase them?) The theme here is pretty standard – think Amityville Horror with some Poltergeist and The Exorcist thrown in. However, there are enough new turns and twists, along with some truly creepy and scary moments, that the movie ends up working just fine. So, what made the movie scary for me? I think a lot of it had to do with the setting. The movie is set in the early 1970’s, which provides an interesting contrast relative to my life experience, and probably that of many others. This is the period was when I was a child, and there are a plethora of familiar images running through the movie, from the wood paneled station wagon, to the horribly loud patterned and mismatched clothing, to what I think were FireKing coffee mugs. All of these things created little nudges to my memory and represented a sort of nostalgic innocence, so having this setting disrupted by a haunting and demonic possession is especially jarring. I think that all of these little touches really nail down the setting and definitely pay off in the end. It brings back all of those old fears from your childhood: the dark basement, thinking that something is hiding in the corner of your room, and the freaky haunted closet. The other thing that worked for me — and which always works for me — was the idea of something (not someone) grabbing your foot in the night while you are asleep. This was actually taken to new heights for me in the Paranormal Activity movies, but it always scares me. 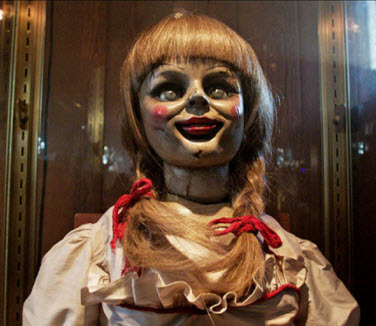 The Conjuring also uses an old game — the clapping game — effectively. This combined with the foot grabbing made me think back to the first time I read Shirley Jackson’s The Haunting of Hill House. That scene where our heroine tells her friend to quit holding her hand so hard, and her friend says that she isn’t holding her hand — it’s a total creep out. So, be prepared for bumps and bangs, physical assaults, pop-up scariness, an interesting twist on the old ghost under a sheet, and unplanned exorcismic activity. The Conjuring definitely delivers.